About “That Was an Accident!” | That Was an Accident! Wut haz teh intarwebs dun to me? Most of the things that happen to my goblins are accidents. Most of their ideas are, too. This blog probably counts as another one. Written and badly Photoshopped by Prinnie Powah, also known as Beth. 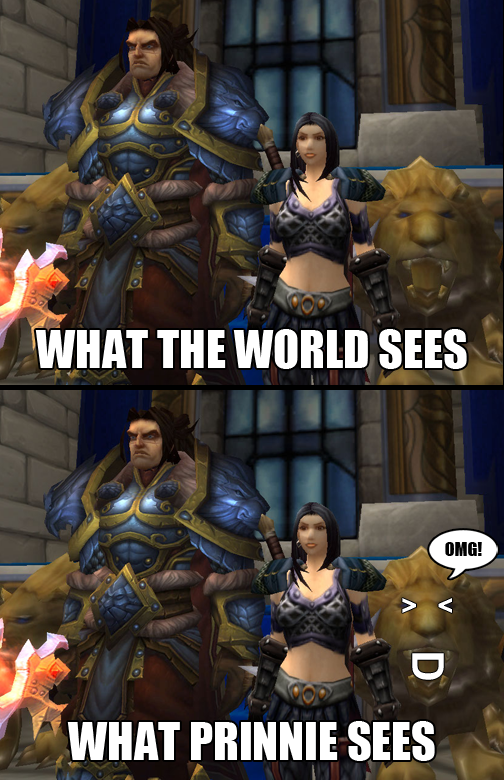 “That Was an Accident!” is part transmog, part adventure and mostly silly. I just found your blog today, quite by accident 🙂 Googled “what addons are best for lfr healing” and your site was near the top – who knows how or why! I have been nearly in tears the rest of the afternoon reading your material. ABSOLUTELY LOVE IT! I am definatly bookmarking this page. Thank you! This has made my world a little bit brighter today and I suspect for many days in the future. Thanks so much! I’m glad you like the blog. As far as addons go, I guess the only thing left is trial and error to see which one you like! I’ve gotten so used to Vuhdo by now that I literally cannot heal without it. I get all confused about having to press buttons on the keyboard. Alternately, if you’re on US servers, let me know your Battletag thingie and I can help out. Is Darkside of Whimsical still around? Yes it is – I’m fairly certain Shao is still around, but I’m not sure of the others. I’m now in a different guild, Wyrmrage Razor. I dunno if the free to play client can do battletag thingies, so in the next few days, I’ll likely spend most of my time on Bombelina, Thermalix, Betheki (all Horde) or Niremere (Alliance). Will do when I’m online later. I’d say the two biggest things are regular updates and constant commenting on other WoW blogs – in essence building up a reason for people to read and links for them to get to you for that purpose. I’ve noticed a distinct drop in traffic that I associate with posting less these days (not as much reason for people to check in). Posts getting comments seems to help attract attention to them. For a period there, I was also linking to other blogs in my blogroll and commenting on a post of theirs, saying, “Hey, I’ve linked you if that’s ok. If not, let me know!” or something like that.